No better place to get in touch with your inner Muse and let your creative battery be recharged then in charming, quint, fishing village of Ajijic. Even tho an attraction for thousands or Canadian and American retirees, Ajijic has a unspoiled sweet and whimsical charm. I was surprised to see horses using part of dried up beach as pasture, dance lessons in the park Sunday evening, an over all friendly and welcoming hospitality atmosphere from the locals. We discovered an amazing place to eat, the Chile Verde kitchen. family owned, the mother cooks with the fresh produces of the day and the sun and doughtier serve at the 3 tables and deliver all over Ajijic. About the workshop feel free to print our flyer and share it with friends! Ajijic is an amazing place even during the Summer. We have heard about the rainy season, and we were concerned about it. But the fact is it rains mainly at night or in the evenings. The days a bright and sunny the birds are chipping most of the day and early morning here at Hotel Casa Blanca (www.casablancaajijic.com) and it is an over all a relaxing and tranquil atmosphere. 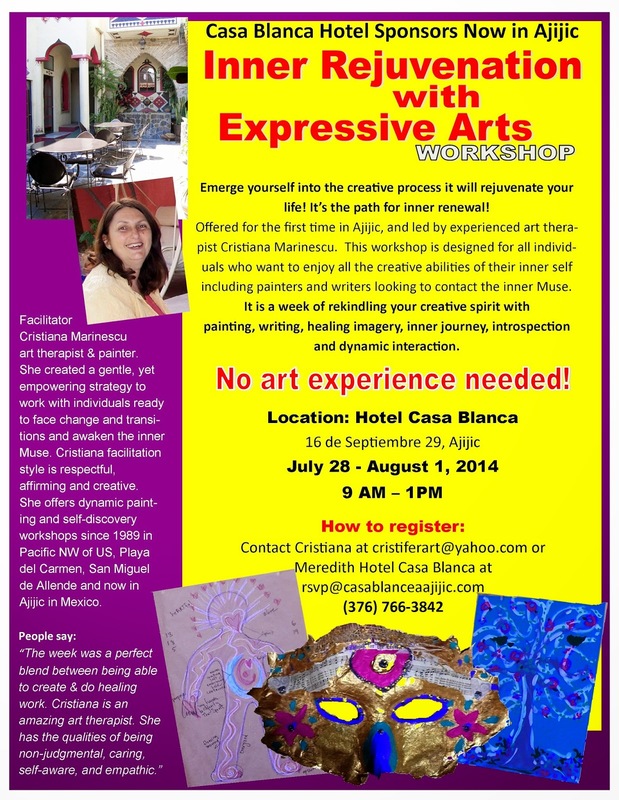 Join us in the last week of July for a fun workshop and stay another week or two at the casa Blanca Hotel! The manager Meredith will give you a good deal and you'll be well taken care of.